Altmetric Badges, that give a visual indicator of the impact a publication has had on the Web, have been added to STORRE. As a result of some local development work, you’ll now see the badges at the top of any STORRE record that has an Altmetric score. Altmetrics are a new way of assessing the impact of journal articles. Traditional metrics are based on how often articles are cited in the formal literature by other journal articles. 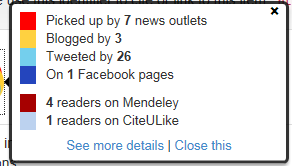 Altmetrics, on the other hand, count mentions of scholarly articles in web based sources such as twitter, online news stories, blog postings, facebook, mendeley, etc. The badges look like a lovely coloured “donut”. The number at the centre of the donut is the headline number of mentions of the article in sources monitored by Altmetric, and the colours round the edge indicate the type of mentions (and their weightings). Hover your mouse over the donut and you’ll see the types of mentions the article has had. Click on the donut to see even more details via the Altmetric website and to click through to the original source where the article was mentioned.